All buildings tell of how those who made them thought and think. Old buildings are a unique cultural reservoir of rich lessons for us all. Old buildings are simple in their construction, modern buildings are not. Repairs add layers of history which are incredibly instructive. Too often today people are blind to the simple approach which we can see in old repairs. Timber is an incredible material. In buildings it has lasted for over a thousand years and is still going (at Herculaneum close to two thousand years), and it is easy to work with, with simple skills and tools. In every village and town we have joiners whose skills are underused; they train as joiners and then we use them as carpenters! 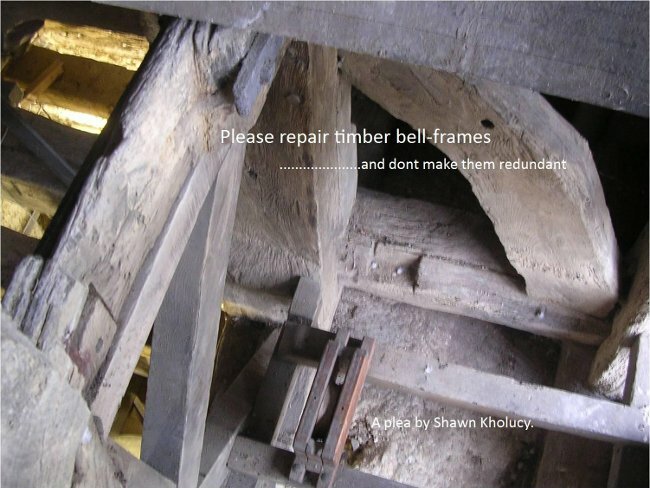 I believe that the decline in the repair of timber bell-frames in recent years has come about by accident. Bell-hanging firms, who parishes often look to for advice as to the well-being of their frame, are usually not repairers of frames; all they ask for is a rigid frame on which to hang their bells. Too often church architects and surveyors don’t get involved in works to bells and organs, seeing them as ‘furnishings and fittings’. Structural engineers, more used to relying on steel manufacturers’ strength tables for new work, which they can specify from their desks, and unfamiliar with and unused to crawling in church towers are frequently not geared up for repairing things and may not be acquainted with the repair methods at their disposal find it easier to specify new steelwork. 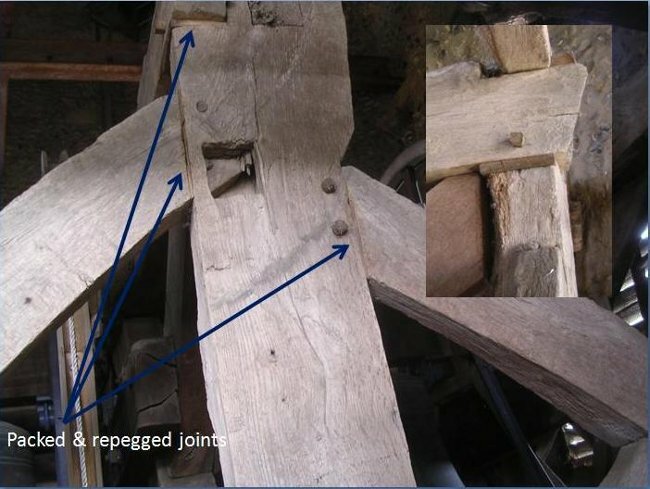 Of late in Suffolk timber bell-frames have been condemned by structural engineers with the claim that repair will be too expensive, this is often without a thorough analysis of the structural ability of the frame. In fact a disproportionate amount of the expense will be in the time spent in measuring, drawing and looking at the frame. If this was a church porch there would be no question that such time would be afforded; if a grant is to be forth-coming English Heritage and all others will take it for granted. And I fear that English Heritage’s silence when a bell-frame’s future is being discussed is often misconstrued. As bells do not usually qualify for grant aid they feel unable to comment unless the frame is deemed an important historical artefact in its own right. And this last has unbalanced things too. Time and again we’ve seen the goal-posts as to what is ‘important’ change; it always will, so treat it with caution. In the 1940s the National Trust, when they took over Charlecote House in Warwickshire, felt that the fine Georgian furnishings and pictures were the only important objects in the place and dispersed most of the rest. By the 1970s, when the Trust obtained Erdigg, in Clwyd, the goal-posts of interest had moved; the previously dismissed to be unimportant hum-drum paraphernalia of the back rooms of such a house were now seen as ‘treasures’. So this plea is not only to repair the supposedly historically ‘important’ frames, but all. I believe that making them redundant and installing new steel ones instead is incredibly short-sighted for the long-term survival of full-circle bell-ringing. We know that timber survives in our fragile flint towers well, and we can easily repair it and strengthen it if poor care and housekeeping has led to localised decay. We need to keep those skills going, not abandon them for a material which we know readily decays in such environments and when it does, because it expands (unlike timber which contracts) it blows apart the fabric holding it; making the consequential damage far larger and the repair far more extensive. Furthermore, unlike the repair of timber, it relies on specialist skills and machining unlikely to be available locally. Mark implied that the Society for the Protection of Ancient Buildings is a body founded on woolly play-acting and ephemeral notions. He made reference to its founder, William Morris, who he dismissed as ‘a wall-paper designer’ dressing in mediaeval garb. Yesterday, the 29th April, 2011, millions of us witnessed a Royal Wedding at Westminster Abbey, that it was steeped in mediaeval imagery didn’t strike us as odd at all. In fact, unlike in William Morris’s own day, when the dress that a bride wore to her wedding was of the fashion of her time, today the bride who does not dress in mediaeval-inspired garb for a church wedding, a long white dress, risks adverse criticism. The Society was founded not, as was implied, in a dilettante manner favouring stage-settery, but as a direct response to the fakery that was resulting from works to historic buildings that ignored how their age had actually built them and arrogantly applying to them what the modern age thought they ought to be like. It called for ‘Repair’ not ‘Restoration’; the ‘Repair’ of historic fabric, so that the fabric, understood or not, remains for those that come after us to have the opportunity of learning from it, in preference to ‘Restoration’ whereby the old fabric is swept away in favour of what the current age thinks to be more appropriate. And this is the basis of my plea. To us the 1723 timber bell-frame of Eye church may not be particularly special, but we don’t know what lessons it may hold for those yet to come. While we can repair it and keep the bells there ringing I believe that that is what we should do. If we abandon it (and don’t assume that leaving it without its bells in it is somehow leaving enough of the story to make it clear to others how it worked) they won’t have the chance given to us. Since its foundation the Society for the Protection of Ancient Buildings has encouraged and developed repair methods which are now the common palette used everywhere in repairing old fabric. It has now built up over a century-and-a-third of such experience which it passes on through its visits, training courses and publications to show how ignorant and crass replacement can be cost-effectively and easily avoided. One such is concerned specifically with and simply called Timber Bell-frames. The Church Buildings Council have also published their Code of Practice called the Conservation and repair of bells and bellframes, throughout they, echoing the listing system which technically covers the bell-frame when in a ‘listed’ building (which most are) favours repair and presumes that the frame will be repaired. How disappointing it then is, given these efforts, to discover that DACs not only fail to pass knowledge of these on to parishes in need of help and advice, but also fail to implement their guidance themselves! Most timber frames have been repaired in the past and the beauty of them is that they can be repaired again and again. Derogatory claims that such repairing is but poor ‘patching’ severely misses a great quality of the material, and only panders to the vagaries of the international metals commodity market. So that is the reason for my plea. Timber bell-frames are simple structures which we can keep well-repaired if we make a little effort. The knowledge, skills and how-to information is out there for you. Timber really is an incredible material; it has a higher strength-to-weight ratio than steel, we can grow it, repair it, add to it, and as long as we look after it it lasts indefinitely. And the skills for working with it exist in every town and most villages in Suffolk.